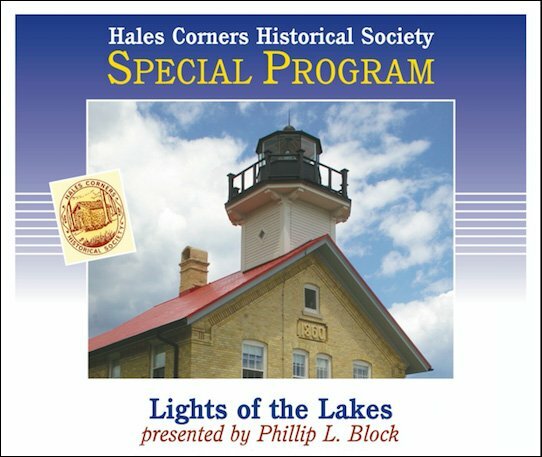 “On February 7th, the Hales Corners Historical Society presented a program, “Lights of the Lakes,” by Phillip Block, featuring lighthouses on Lakes Superior and Michigan. Our Society schedules four programs annually with a focus on Wisconsin history. With only a few exceptions, our speakers have provided photos, illustrations, maps, etc. using laptops with PowerPoint technology. Mr. Block was the first to incorporate music and the sounds of waves lapping at the shores and even the foghorns of ships and lighthouses themselves. Phil’s knowledge of the subject was incredible. A majority of the photos used in the program were taken by Phil on location, and many of these lighthouses are difficult to reach. His research allowed him to show previous photos of these locations for comparison purposes. In addition, Phil’s narration provided details on lighthouse construction and their technology as well as insights into the various industries that depended on the lighthouses to help them ship their products safely across the Great Lakes.